To see the new phase of the crisis, which began with the bursting of the speculative bubble in 2008, as just a repeat of the same decades-long pattern of boom and bust, is a mistake. It is a gross misunderstanding of the impasse that capitalism has come to today. Similarly, to think of this or that strike, this or that protest as being in the old framework, that is that it will somehow end as "usual" in trade union negotiations based on compromise and accepting some austerity measures (thus preparing the way for further attacks on workers) is equally wrong. It fails to see and understand the depth to which workers' conditions have deteriorated to unbearable levels and that this is the material basis of the militancy that workers have been forced to adopt. This does not imply by any means that capitalism will crumple under the weight of its own contradictions and that a workers' victory is inevitable. Far from it. It simply means that the class struggle in coming weeks and months is going to get sharper and harsher than it has been for decades. And the ruling class as always will use their naked barbaric oppression as well as the usual dirty tricks aided by the reformists of the left of capital. This is exactly what took place in Haft Tapeh. First Ismael Bakhshi with 18 other workers and a female reporter/social activist, Sepideh Ghalian were arrested. The next night Ali Nejati a retired Haft Tapeh ex-delegate, undergoing treatment for heart failure was taken from his house by security forces, in the middle of night. Over the next few days scores of other worker activists were told to report to the intelligence services office in Shush where they were interrogated before being released after a few hours. All this was intended to create an atmosphere of fear throughout the entire working class neighbourhood. Then some of the delegates were freed, possibly to try to create atmosphere of suspicion to divide the workers. They then announced that two of the four month of arrears of pay, would be settled shortly! Despite all this, the protest continued, but with a new demand on the list, for the release of the arrested workers. "...What have Bakhshi and Armand said? Nothing else but voiced our words ........... Some people do not want to deal with the problem, so they deny the existence of the problem itself, why do you want to blame Bakhshi, and for what?..." "Dear sir, your belly is full (not hungry), you say that you understand us. I swear that you do not understand us. How could you understand us? As the old proverb says "the full belly, has no idea of how the empty belly (hungry) feels." "...We're hungry sir, and a hungry man is capable of doing anything. You see how my hands are shaking, I have a sick baby, I cannot help him.... he vomits ...."
"I wish that a Prophet would come and save us ...... see how my hands are shaking..."
"Kiyomars Kazemi was introduced on Saturday in a ceremony in the presence of a number of provincial and city officials and workers' representatives as the new CEO of the Haft Tape Sugar Cane Industry Company." There is no information about who these "workers' representatives" might have been. On 11 December Ismail Bakhshi was freed. But until 23 December there was no sign of him and no reporter managed to see him or report of him before this date, when he wrote in his Instagram's post with two photos of the first day of freedom, as well as the day of his return to work, which was addressed to the Iranian people under the title of "Thank You". "Although I no longer understand the meaning of freedom, I do not comprehend it, I felt a little bit free." He also thanked workers, trade unions and labour organisations, teachers, students, the community of doctors and nurses, marketers, all the guilds and associations, artists, writers and poets who supported him. What happened during the strike in Haft Tapeh, was a bright and promising start of the Iranian working class movement to break away from traditional legality confined to trade union methods. The workers of Haft Tape demonstrated in a most decisive way that the future belongs to soviets. During the 40 years of Islamic Republic rule, the tendency towards linking their isolated struggles together has never have been so noticeable as it is in Iran today. In many strikes and protest of workers, students, teachers, lorry drivers... now dozens of them all over Iran, releasing of imprisoned workers of Haft Tapeh and Steel workers of Foolad, has become a common demand in almost all of them. The usual traditional boundary by trade, ethnicity, religion, gender is cracking to a degree that in Tehran, the retired armed forces gathered in front of the Iranian parliament  and listed among their demands release of Haft Tapeh and Foolad Steel imprisoned workers. The demands of Haft Tapeh workers for a soviet type of rule may have been silenced in Shush for now, but it has echoed far beyond Shush. Now the whole of society is paying more attention towards the workers' struggle. There is no doubt that in the future this will be referred to as a turning point in the Iranian working class movement. Predictably, all shades of opposition are increasingly defining and labeling these workers as magnificent for flexing their muscles. They are attempting to recuperate them as part of the general struggle of the whole nation in its everlasting desire for "freedom" or even worse for “democracy”. "...Today we have gathered to see what the meaning of the Independent Workers' Soviet that we keep talking about is. It means to get together, not to have anything to do with anyone else. If you have put your hopes on the state's help, if your hope lies with the private sector, I do not know, but if you hope that someone else will come to rescue us, let me put your mind at rest. It's going to be the same, it will be the same soup and the same bowl all over again. ...The first speaker – that is his majesty! – after the forum, will return to his mansion, to his family, to rest till the next meeting, living off the capital his family took from Iran 40 years ago. He is accompanied by a security guard just in case, and the second speaker despite emphasising in his speech the peaceful nature of the workers’ demands, gets arrested, tortured… this is the gap between these two worlds, nothing will fill this gap but the revolutionary overthrow of world capitalism. 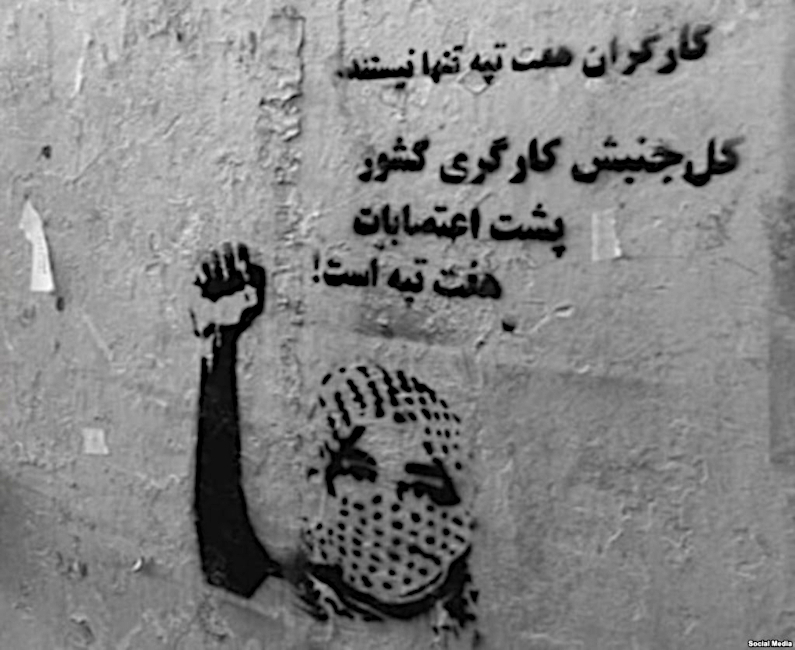 The wall graffiti in the photo above says "workers of Haft Tapeh are not alone, the whole workers movement of the country supports them"
Good article. Highlights how the situation of workers in Iran is not just down to ‘sanctions’ or peculiarities of the Iranian economy. Unwittingly the Financial Times has just acknowledged the serious economic crisis in Iran by an absurdly exaggerated piece on migrants from Iran forming the majority of ‘small boat’ illegal ‘entrants’ being chased round the British coast by the UK border patrol.